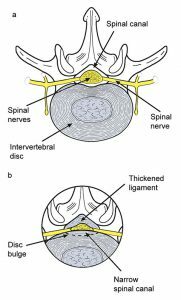 This page will provide you with information about having a lumbar discectomy/laminectomy. For further details, please speak to your consultant. This condition occurs when there is a narrowing of the spinal canal in the lower back, sometimes causing pain or weakness in the legs. Your vertebrae are the column of bones that form your spine. The vertebrae are curved and are linked together with smaller facet joints and separated by spongy discs. 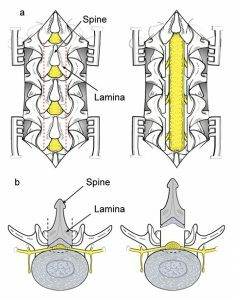 The laminae (the official term for the curved joints) form the spinal canal – like a tunnel protecting the spinal cord, which runs from your brain down the canal. The spinal cord’s nerves and blood vessels lead into the canal via the vertebrae. The nerves communicate messages from your brain enabling muscle movement. They also transfer messages from your skin alerting you to both touch and pain. There is a natural tendency for a narrowing of the spinal canal as we age. This is to do with wear on the facet joints, a thickening around ligaments that are in close proximity and also discs bulging. Arthritis and other bone problems in the spine can also cause the spinal canal to narrow. Some people have a narrow spinal canal from birth. This narrowing, whatever its cause, means that space for both the nerves and blood vessels is compromised. This results in poorly working nerves, especially if you have been exercising or standing for long periods of time. Some symptoms include a tingling sensation or pain in the leg, which can prevent normal walking. Relief can often be found by bending forward or sitting down. Surgery can offer relief from pain and the ability to walk further. Surgery will also ensure the symptoms do not worsen. Mild symptoms may not need any treatment; acute or worsening symptoms are usually candidates for surgery. Over time your symptoms are more likely to get worse rather than better, although some do see an organic improvement. If symptoms do not improve surgery may be the best route. In preparation and to plan the operation an MRI scan will confirm diagnosis. Various anaesthetic techniques are possible for use in this type of surgery. These will be discussed with you by the anaesthetist and a specific technique will be recommended. Sometimes antibiotics are given during the operation to protect against infection. You can expect this surgery to take between one and three hours. A vertical incision will be made in the centre of your lower back and your muscles will be parted to access the spine. To widen the narrow part of the canal, bone and ligament tissue will be removed. This will allow more room for both nerves and blood vessels to function. Your skin may be stitched together or clipped to close the incision. Inserting a drain or tube under the skin will help the wound to heal. If this procedure is used, the drain is usually removed within the first two days after surgery. You will be able to return home approximately two or three days after surgery, unless the doctor feels you would benefit from staying longer. The wound needs to be kept dry for four – five days. The health care team will explain when you need new dressings or stitches / clips removed. Once home, follow the instructions of your health care team carefully, including taking medication or wearing special stockings. Follow the programme of exercises given to you by the physiotherapist to strengthen your back. The exercises will help protect you from getting similar back problems again. The healthcare team will tell you when you can return to normal activities. Make sure that you do not lift anything heavy or twist your body. Good posture when sitting and walking and regular exercise will help you to heal and get back to normal as quickly as possible. However, before you start any exercises please speak to your doctor the healthcare team. Narrowing of the spinal canal in your lower back is known as lumbar spinal stenosis, a condition which may cause weakness in the legs or pain in the lower back. The surgical procedure aims to inhibit deterioration of the condition.